Portugal is a country in Southern Europe on the Iberian Peninsula. Portugal is the westernmost country of Europe. It is bordered by the Atlantic Ocean to the west and south and by Spain to the north and east. Three groups of islands in the Atlantic Ocean are also part of Portugal: the Azores (Açores), Madeira and the Savage Isles (Ilhas Selvagens). The Savage Isles are a small group of islands with nobody on them, controlled by Madeira. Portugal claims that Olivença is also part of its territory, but actually it is controlled by Spain. Portugal became its own kingdom in 1139 but was not officially recognized until 1143. The border with Spain has been almost the same since the 13th century. Fishing and trade with other countries are important here. Portugal was important in world exploration for two reasons. Henry the Navigator, a prince from Portugal, was very interested in exploration. Inventions in navigation led to a bigger knowledge of geography. This world exploration began the Portuguese Empire. Portugal was a world power during the 15th and 16th centuries. However, it lost a lot of money soon after this. The city of Lisbon was destroyed in an earthquake in 1755. The country was occupied during the Napoleonic Wars. It lost its largest colony, Brazil, in 1822. In 1910, Portugal became a Republic, and in 1926, a military group took control of the country from the Portuguese 1st Republic. This began a time of rule by fascist governments that lasted until 1974. That year, a peaceful left-wing army coup, called the Carnation Revolution, happened. The coup changed how the country was run. The next year, Portugal allowed its colonies in Africa to be on their own: Mozambique, Angola, Guinea-Bissau, Cape Verde and São Tomé and Príncipe. East Timor in Asia declared itself independent from Portugal on 28 November 1975, and was invaded and occupied by Indonesian forces nine days later. Portugal went into the European Union in 1986. Another Asian colony, Macau, became part of China again in December 1999. 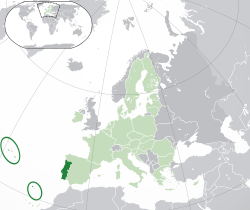 The main language of Portugal is Portuguese. Some famous Portuguese people are D. Afonso Henriques, Henry the Navigator, Bartolomeu Dias, Vasco da Gama, Pedro Álvares Cabral, Ferdinand Magellan, Luís de Camões, Fernando Pessoa, Amália Rodrigues, Álvaro Siza Vieira, Eduardo Souto de Moura. Luís de Camões wrote the national poem of Portugal. It is called Os Lusíadas and was written in 1572. ↑ 3.0 3.1 3.2 3.3 "Portugal". International Monetary Fund. http://www.imf.org/external/pubs/ft/weo/2011/01/weodata/weorept.aspx?sy=2008&ey=2011&scsm=1&ssd=1&sort=country&ds=.&br=1&c=182&s=NGDPD%2CNGDPDPC%2CPPPGDP%2CPPPPC%2CLP&grp=0&a=&pr.x=40&pr.y=5. Retrieved 6 May 2011. ↑ "Gini Index". Instituto Nacional de Estatística. http://www.ine.pt/xportal/xmain?xpid=INE&xpgid=ine_destaques&DESTAQUESdest_boui=107634627&DESTAQUESmodo=2&xlang=en. Retrieved 14 July 2011. ↑ "The Euromosaic study, Mirandese in Portugal". Europa. European Commission. Archived from the original on 13 March 2007. http://web.archive.org/web/20070313113715/http://ec.europa.eu/education/policies/lang/languages/langmin/euromosaic/pt1_en.html#13. Retrieved January 2007. ↑ "The Lusiads". 1800-1882. http://www.wdl.org/en/item/11198/. Retrieved 2013-09-02. This page was last changed on 31 March 2014, at 12:45.